Viewing time: 5 min. 58 sec. The Write Question is a weekly video podcast all about writing. 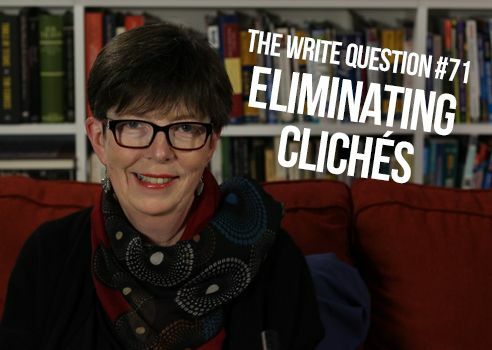 Today’s question focuses on eliminating or reducing cliches. If you have a question you’d like me to answer, email me at daphne@publicationcoach.com, tweet me @pubcoach, or leave a message for me at the Skype account, The Write Question. Welcome to The Write Question, I’m Daphne Gray-Grant and my topic is eliminating or reducing clichés. Today, I have a question from Judy Minkove calling from Baltimore. Here’s what she’s asked. “I wanted to submit my question to you…It’s about how to avoid slipping clichés into your writing and how to find alternatives. I struggle sometimes with finding compelling metaphors that aren’t overused and sometimes my editor will say that it’s cliché and I’m trying to think of an example: something like ‘going the distance,’ or ‘drawing a blank’ (as I am right now!) are clichés. So I look forward to hearing your answer. Thanks for your question, Judy. Let me start by putting your mind to rest about one important issue. It’s entirely natural and normal that your first draft should be filled with clichés. Why? Because a cliché is an idea or a phrase that has been used a great deal. Yes, they’ve been used so much that they’re no longer interesting or effective but they’re in your mind precisely because of that overuse. You’re familiar with them! If you are writing quickly then clichés are bound to spring to mind. And don’t criticize yourself for that. Your first draft, what I like to call your crappy first draft, should have all sorts of problems. In fact, if your first draft doesn’t have enough problems, it likely means you’ve spent too much time polishing and editing it while you should have been writing. So, much as you hate those clichés, welcome them because they are a sign that you’re allowing yourself to write quickly enough. When I find myself spouting clichés — as I do, just like you — I simply write the word cliché after it in square brackets, as a reminder to myself to go and fix it later, when I’m editing. It’s important to let go of any notions of excellence or achievement while you are writing. Instead, just write. The time to fine-tune your prose — to make it better, sharper and more interesting — is when you are editing. And that’s the time when you should deal with clichés, as well. So, let me move to part 2 of your question: How to refresh those tired and worn out expressions. Start by analyzing the core message of the cliché and then try to find another way of saying the same thing. For example, “a level playing field” might be replaced by the word “fair.” It’s shorter, clearer and uncliched! Sometimes, however, you might want to maintain a cliché, but tweak it slightly to make it more interesting. Murdoch [senior], who is eighty-one, abhors gossip about his successor. Like Charles de Gaulle, he cannot imagine death knocking on his door. The personification of death is an old trope — and not one I’d encourage most writers to use. What saves it here is the splendid comparison to Charles de Gaulle. It caught me short — took me by surprise. I wasn’t aware that de Gaulle had been afraid of death. And do you see how that new fact instantly elevates what would otherwise have been a very old and tired cliché? I’ve included a link to the piece, below. I’ve always enjoying seeing clichés exploded — either by being replaced with fresher more vital images or, paradoxically, by being explored in greater detail. How does that work? Here’s an interesting example from a book I read several years ago, The Grief of Others by Leah Hager Cohen. Somewhere, far away, too far for her to do anything about it, a train wreck was in progress, tons and tons of metal collapsing on itself, whole compartments combusting, grass bursting into flame and smoking alongside the tracks. Of course, the phrase “train wreck” is a cliché. But doesn’t this detailed description make it come to life? Cliches are clichés only if we use them mindlessly and fail to edit them. Thanks for the question, Judy. Don’t be too hard on yourself. Instead, just make dealing with clichés a core part of your editing process.